Surveying and classifying previous work on a particular field brings several benefits, which are: 1) to help organise a given body of knowledge; 2) to provide results that can help identify gaps that need to be filled; 3) to provide a categorisation that can also be applied or adapted to other surveys; and 4) to provide a classification and summary of results that may benefit practitioners and researchers who wish to carry out meta-analyses. This chapter presents a survey literature of size measures (attributes) that have been proposed for Web effort estimation. These measures are classified according to a proposed taxonomy. We also discuss ways in which Web companies can devise their own size measures. Web Size Measure: A measure used to forecast the size of a developed Web application. The size measure may assume that application’s size corresponds directly to the size of the problem to be solved in order to deliver a corresponding application, or it may assume that an application’s size corresponds to the actual delivered size of an application. 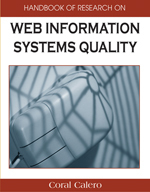 Web Software Application (Christodoulou et al., 2000): A conventional software application that relies on the Web or uses the Web’s infrastructure for execution. Typical applications include legacy information systems such as databases, booking systems, knowledge bases, and so forth. Many e-commerce applications fall into this category. Typically, they employ development technologies (e.g., DCOM, ActiveX, etc. ), database systems, and development solutions (e.g., J2EE). Effort Estimation: To predict the necessary amount of labour units to accomplish a given task, based on knowledge of previous similar projects and other project characteristics that are believed to be related to effort. Project characteristics are the input, and effort is the output we wish to predict. Web Application Design Model: A conceptual representation of a Web application. Such representations are characterised by models, for example, navigation model or presentation model. These models are abstractions that later are translated into an implementation of the Web application. Web Application: An application delivered over the Web that combines characteristics of both Web hypermedia and Web software applications. Size Measure Class: Classifies size measures into either of three possible classes: Length, Complexity, and Functionality. Length measures the physical size of an application; Functionality measures the functions and features supplied by the application to the user; and Complexity measures the structural complexity of an application, where the application’s structure is represented by the way in which nodes (e.g., Web pages) are interconnected via links.